Living United States veterans who served on active duty in the U.S. Armed Forces at any time during the period of November 1, 1955 to May 15, 1975, regardless of location, are eligible to receive one lapel pin. 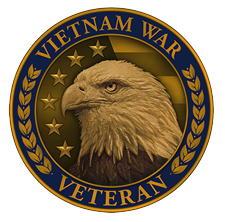 For the Vietnam Veteran Lapel Pin Fact Sheet, click here. To register to be presented the Vietnam Veteran Lapel Pin during the next scheduled event in or near San Angelo, Texas, please complete and submit the form below. *If you are unable to attend our scheduled events, locate other upcoming commemorative events by visiting https://www.vietnamwar50th.com/events/. Enter your zip code to locate the nearest events. The blue pins represent future events. Click on a pin for event details, including contact information. If there are no blue pins in your area, check back frequently, as new events are added every week! Veterans who still need help finding a commemorative event can email whs.vnwar50th_CPP_EVENTS@mail.mil or partners@vietnam50thcpp.com. Please include the city and state of where you are located.